…is in stores TODAY. And hopefully tomorrow too. 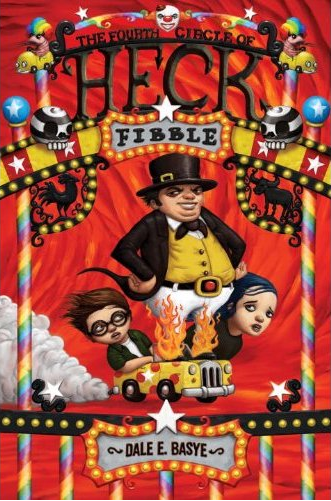 If it ISN’T in your local bookstore, then raise an unholy ruckus as only you Heck fans can. And what DO you Heck fans want to be called, anyway? I Double- Dog Dare You to Get a Free Book! Kids 12 and under can read any 10 books, complete this form, and Borders will give them a FREE book! No purchase necessary. Challenge form must be completed and brought to any Borders, Borders Express, or Waldenbooks store 6/1/11 – 9/5/11 to redeem coupon. Offer valid in-store only. Blimpo: Now Available in Convenient Paperback Form! Yes, for those of you who have complained of arm strain from holding the hardcover version of Blimpo, we have created a new, lighter-weight solution: perfect for reading on-the-go or absorbing large spills. Apparently Blimpo-the third in the Heck saga—is featured in a spiffy new display at a book retailer near you. If you send me a picture of this display, I may or may not send you an autographed book. It depends.